KALAMA, Wash. — In a span of just 21 hours over the weekend, violence rocked Cowlitz County, leaving two people dead and a community in mourning. A Cowlitz County deputy was shot and killed Saturday night, and by Sunday evening, a suspect was shot dead by two Kelso police officers. Officials have identified the deputy as 29-year-old Justin DeRosier from Kelso. He leaves behind his wife and his 5-month-old daughter named Lily. 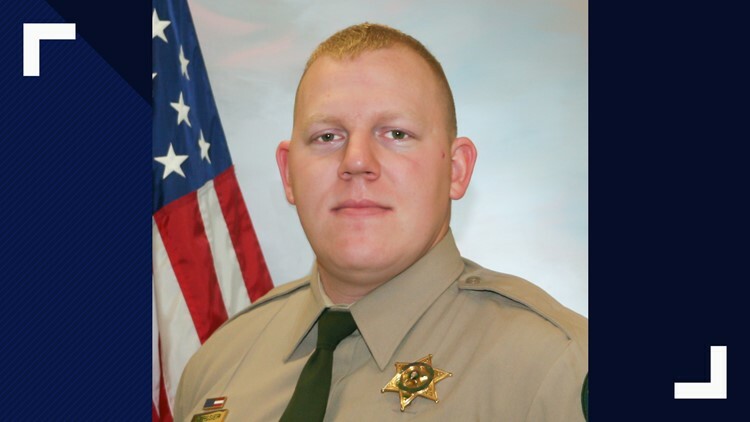 Cowlitz County Deputy Sheriff Justin DeRosier was shot and killed in the line of duty on April 13, 2019. "The danger is over. Anyone involved in this [shooting] in any significant degree has been contacted and detained," said Cowlitz County Sheriff Brad Thurman on Monday. "People are going to be brought to justice on this." On Sunday night around 7 p.m., two Kelso police officers responded to a suspicious subject call in the area of Spencer Road in Kalama. Officers saw the suspect show a gun and shots were fired. The suspect was later pronounced dead. He was identified Monday afternoon as 33-year-old Brian Butts, of Kelso. Sheriff Thurman confirmed that Brian Butts is related to Daniel Butts, who killed Rainier Police Chief Ralph Painter in January 2011. Daniel Butts' father told KGW that his son and Brian are half-brothers. They have the same mother and their fathers are brothers. The two officers involved were identified Monday as Sgt. Rich Fletcher and Det. Tim Gower. Both are 24-year veterans of the Kelso Police Department. They have been placed on paid administrative leave during the investigation per department policy, Kelso Police Chief Andrew Hamilton said. No police were hurt in the Sunday gunfire. "We're very proud, in the tense situation they had to deal with, of their professionalism," Hamilton said. Brothers Matthew and Michael Veatch were also arrested. Both are associated with the suspect. Matthew, 25, was accused of "rendering criminal assistance in the first degree," said Clark County Sheriff's Office Sgt. Brent Waddell. Michael, 33, was arrested on an unrelated outstanding warrant. Officials say DeRosier was shot shortly after 10 p.m., after he was dispatched to a disabled motor home blocking the roadway near the 100 block of Fallert Road, near Kalama River Road. Responding officers attempted life-saving efforts at the scene before DeRosier was transported by LifeFlight to PeaceHealth Medical Center in Vancouver. He died in surgery shortly after midnight from the injuries he sustained. Cowlitz County Undersheriff Darren Ullmann spoke about DeRosier during a press conference Sunday. "There were few cops who wanted to be a cop more than Justin did," said Sheriff Ullmann. "He loved his job. He was incredibly good at it." DeRosier graduated from Kelso High School in 2008 and then from Washington State University with a degree in criminal justice. Before he joined the Cowlitz County Sheriff's Office in 2016, he was a deputy sheriff for the Whitman County Sheriff's Office in Colfax, where he served part-time with the marshals office in Oakesdale. He served as a patrol deputy, SWAT officer, and boat operator at the Cowlitz County Sheriff's Office. "It's a big shock," Thurman said. "Deputy DeRosier and his wife just had their first child five months ago. This is a huge shock to them and our entire department. This is the first line of duty death in 165 years in this department. We don't know how to do this. I hope we don't have to do it again." Thurman said DeRosier's death leaves a void in the department that can't be filled. "He was such a big part of everything," Thurman said. "He only had one speed and that was fast. He had a bounce in his step, always a smile. Whenever we posted a new positioning or any training, we could count on him to put in for it. "He had a very bright future here. It wouldn't have surprised me if he would have become a sheriff himself. He had an unlimited future, and this is a huge void for us," he said. The community gathered in Longview, Wash. on Sunday night for a candelight vigil. Brian Butts was in prison from 2012 until 2017, according to the Washington Department of Corrections. He was convicted multiple drug charges. Anyone with information related to the shooting is asked to call Sergeant Todd Barnes with the Clark County Major Crimes Unit at 360-577-3098. Funeral arrangements for DeRosier are pending. Cowlitz County Deputy Wives set up a Meal Train Plus account to provide meals for the DeRosier Family.